Headed out on the town tonight for New Years Eve? 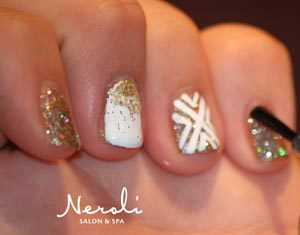 Neroli Salon & Spa Downtown Nail Designer, Lisa is sharing her favortie tips for a quick and festive manicure at home. Step 1: Apply Aveda’s Cuticle Control to your cuticles. Let sit on for 5 minutes; rinse off. Push back cuticles with an orange stick. Step 2: File nails. Apply a nourishing oil to cuties, like Aveda’s Beautifying Composition to add hydration and buff nails. Step 5: Let nails dry for 5 minutes before starting art. 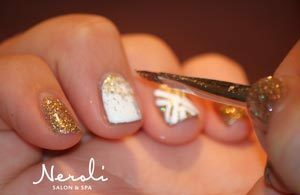 Using your stripper brush with white polish or white acrylic paint, make an “X” across your nails. On the outside of the “X,” paint 4 “V”‘s to make pattern. Let dry. 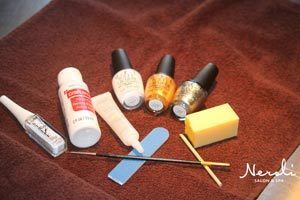 Step 6: Using either your glitter topcoat or your loose glitter (loose glitter can be mixed with any top coat for this as well), get a small amount on the brush and swipe down the entire nail. Let dry for a few seconds. Apply more just at the base of the nail and swipe down slightly. Let dry. Feel free to add more glitter to the base of your nail bed – the amount of glitter you want to add is all up to you! Step 7: Apply top coat (my favorite is Zoya’s “Armor.” Zoya’s drying drops help speed up drying time a lot! Give nail polish about 30 minutes to fully dry. 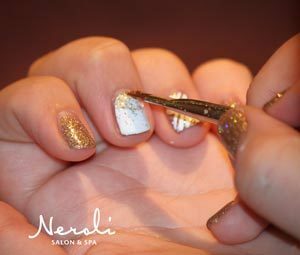 This blog was written by Neroli Downtown Nail Designer, Lisa. 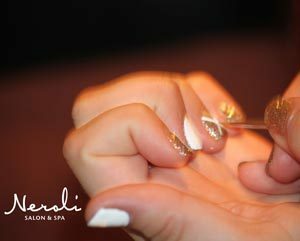 To schedule a manicure or pedicure with Lisa, call 414.227.2888.